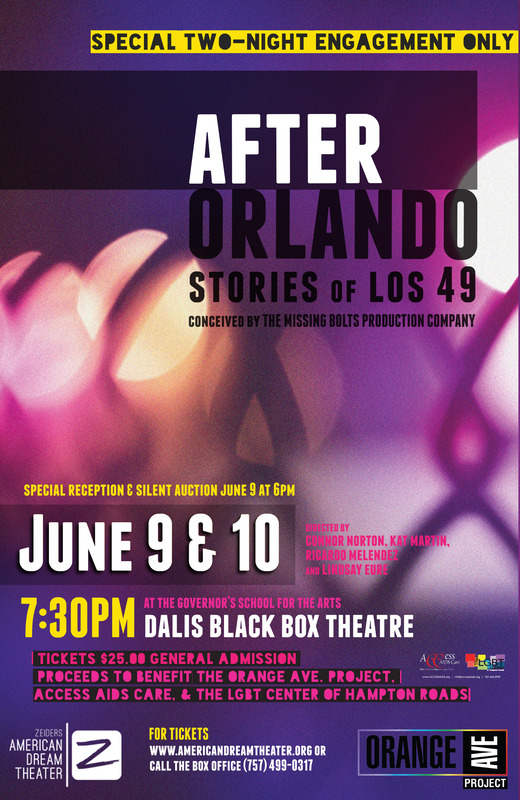 Artists from across Hampton Roads come together to remember the lives of those that were lost on June 12, 2016 with the production After Orlando: Stories of Los 49. Join these talented artist as the emotions and feelings of activists, writers, survivors, and more are encapsulated in 16 short plays written by famous playwrights such as Neil Labute to Amina Henry. Directed by Connor Norton, Kat Martin, Ricardo Melendez, and Lindsay Eure with music by Jake Hull…this performance processes to be as cathartic as it does inspiring for activists, allies, and community members alike. Five dollars of all tickets will be donated to Access AIDS Care and The LGBT Center of Hampton Roads, while the rest will be donated to The Orange Ave Project. Special Silent Auction and Raffle will be available at 6PM on Friday, June 9th.